Enjoy the ultimate in style, comfort and listening pleasure with QKZ CK4 Headphones. 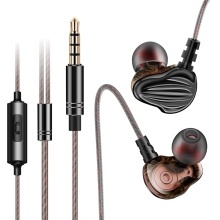 Its noise isolating in-ear design blocks ambient noise to help you focus on listening pleasure. With this product, you can listen to music, answer/end your phone, switch to the previous/next songs. Moreover, the ergonomic design provides long-term wearing comfort and stability, perfect for sports. *7mm and 9mm dual moving coil drive unit delivers more natural middle and high frequency and stronger bass. *Built-in Microphone enables hands-free calls. One button in-line control, easy to control music and calls. *Light-weight headphones with 3 sizes of silicone earcaps ensures a long time comfortable wearing. *Universal 3.5mm gold-plated plug, compatible with smart phone, Tablet PC, MP3 and other 3.5mm audio devices. *You don&apos;t have to worry about running out of power, giving you unlimited wired listening.